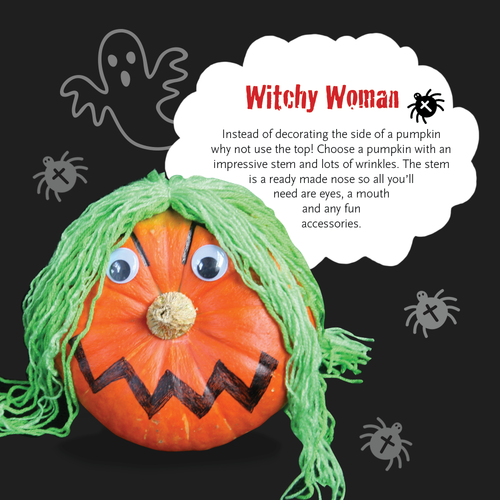 There are loads of fun traditions to celebrate Halloween in all its gruesome glory. Turning it from a scare-fest to a laugh-fest is more child friendly (and arguably more fun), and with a few simple switches really easy to do. We’ve come up with a great list of party games already, but one challenge we’re always asked about is pumpkin carving. Pumpkin carving is great fun. 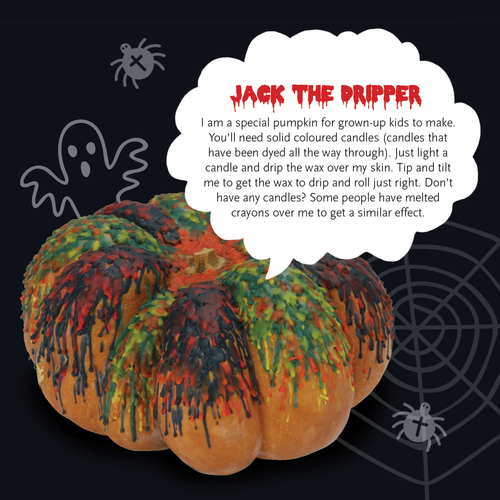 Each year there are loads of incredibly creative creations, but even carving the simple Jack-O-Lantern with triangular eyes and a jagged mouth gives such a cool effect - especially when hollowed out and stuffed with a candle! The problem is that carving isn’t very child friendly. Firstly, you’re using some dangerous-looking tools. Even with the carving kits you’re experimenting with tiny saws, knives and pointed jabbers. And cutting the skin of a pumpkin is no mean feat. The flesh is thick, making cuts pretty tough even if you’ve got adult-sized hands. 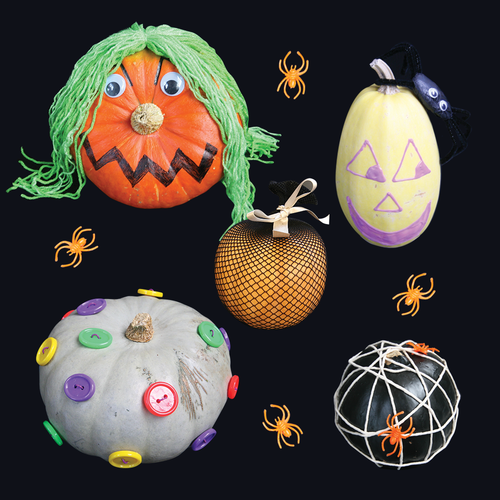 So we’ve come up with our favourite alternatives to carving pumpkins. Inspired by the wild variety of pumpkins and squashes you can pick up, we’ve curated some more ‘classic’ designs, as well as customising these versatile veg in some slightly unexpected ways. Either way, each one has a unique look and is great fun to do with the kids, without the stressful slicing and dicing. Butternut squashes are readily available from supermarkets all year round. 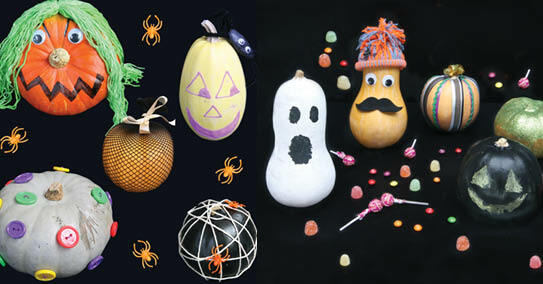 Even if you’re finding it tough finding the perfect pumpkin you should be able to find one of these guys lying around. Paint them white (or any colour you like) and add a surprised looking face. He’s rather not be eaten, after all. Another butternut squash trick. This chap’s not going to bring the scares, but he’ll bring the suaveness. He might even be welcome to stick around after the Halloween party, right on time for the new Hollywood version of Murder On The Orient Express. Murder. Scary! This one will work with any kind of pumpkin you can get your monster claws on. Glow in the dark paint can be picked up at a good art store. You can pick a classic face or do something shockingly surprising. If you’ve read Coraline by Neil Gaiman, you’ll know that buttons can strike fear into the hearts of all of us. If you haven’t, and your child’s up for a fright, it’s a great read. 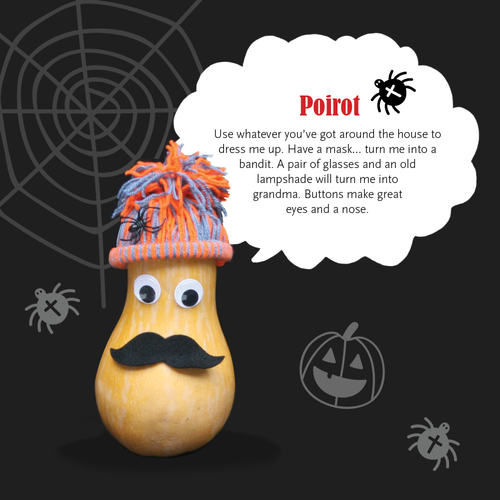 It inspired us to jab some oversized buttons into a sickly green pumpkin. For our special edition Halloween toucanBox collection, we dreamed up a spooky Jack-O-Lantern. And he glows in the dark! 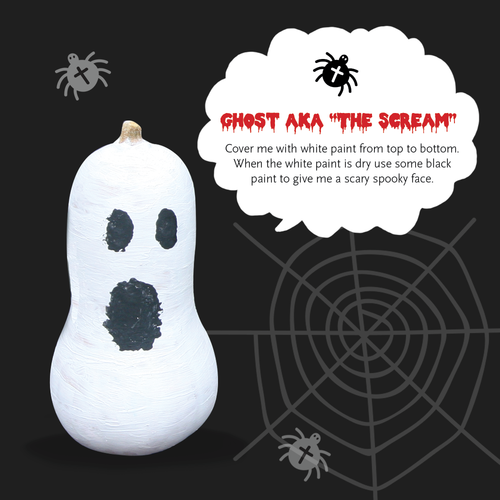 Build him out of tissue paper and orange card, add foam features and drop a glow stick into him to light him up! 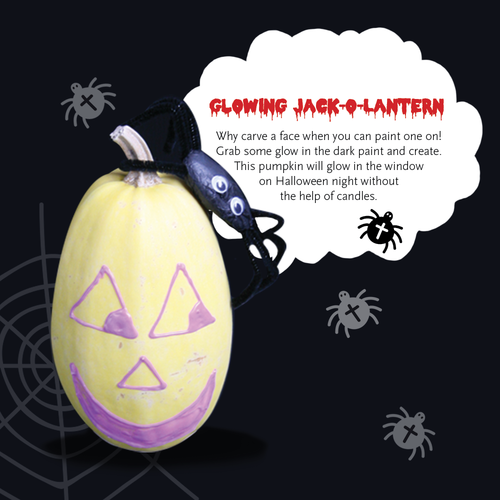 No carving, no mess, just all the benefits of a gruesome glowing pumpkin pal. 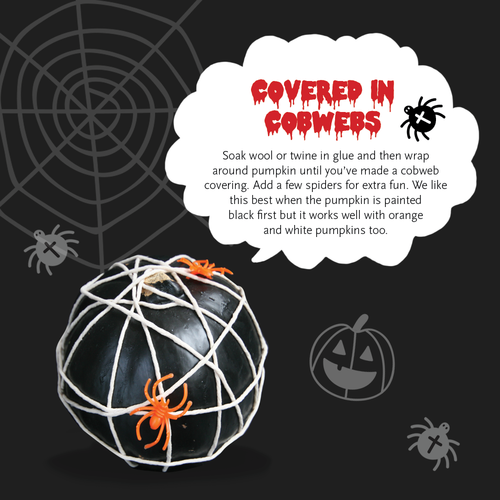 A pumpkin wrapped in creepy cobwebs! It’s like Halloween on top of Halloween. This one is super easy to do - just dip the string in glue beforehand and encourage the kiddies to go crazy. You could pick any kind of glitter. 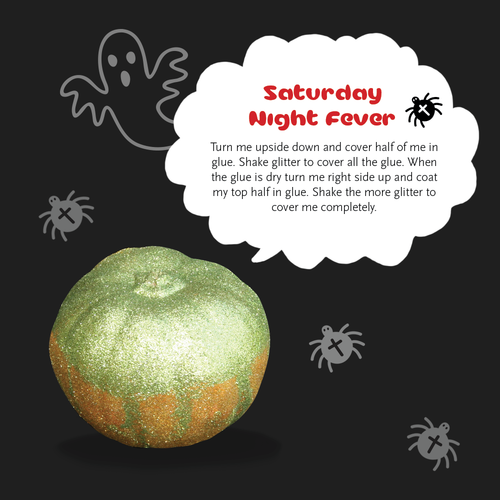 We picked green to give this pumpkin a more autumnal vibe, but if you want to go into full scare mode grab some black glitter. 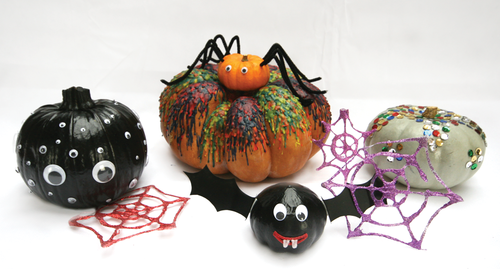 Or for a cool shimmery effect, try orange glitter on top of an orange pumpkin. Chalk paint is a great addition to the art cupboard. A lot of different items can suddenly become 3D chalkboards! 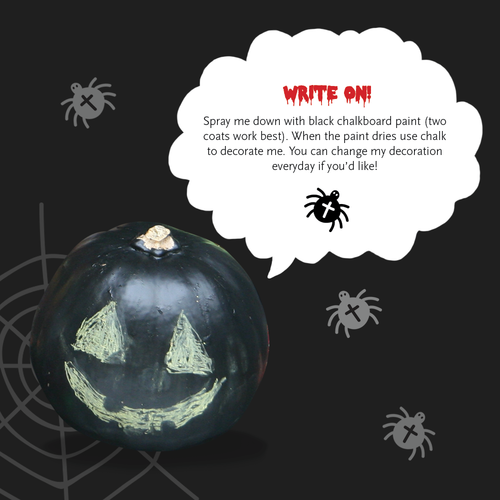 And there’s no limit to a chalky black pumpkin! Add a classic face, spiders, a spooky message or lots and lots of eyes. Boo. Or as we affectionately called him, Jack The Dripper. While this is no-carve, it is playing with hot wax and lit candles, so works better with older kids. Spider. Take a tiny pumpkin, add some eyes and pipe cleaner legs. Cover the pumpkin from head to toe in sequins. Disco! Paint a mini pumpkin black, add wings. Hey presto, a flying bat. Add fancy strips of ribbons! We’d love to see your creepy creations. Don’t forget to share them with us!